Benfica have reportedly set their price for Goncalo Guedes, dubbed as ‘The Next Ronaldo,’ at £52 million, amidst interest from the Premier League’s top sides. Manchester United, Leicester City, Juventus, and Arsenal are among the clubs interested in 19-year-old Goncalo Guedes. However, Benfica remain keen to hold on to their starlet, and have therefore put his price-tag at a rather steep £52 million. Earlier this month, Manchester United sent scouts to watch Guedes in action during a Benfica match before the international break. The Red Devils were believed to be front-runners in the race for Guedes, but according to newspapers in Portugal, Arsenal are also keen to nail down a deal for the teenage sensation. However, both clubs will have to up their game if they are to sign Guedes next summer. Despite having a £52 million price-tag, the 19-year-old is also on contract with the club until 2021. Manchester United may be able to edge out Arsenal in the race for Guedes’ signature, due to Arsenal’s reluctance to dish out large amounts of cash for players. At the age of 19, Guedes is already rated highly, having made 36 first team appearances in Portugal’s top tier league. He has earned 2 caps with the Portuguese National team as well. The youngster primarily plays as a winger, but this season, he has been moved to a more centralized position. 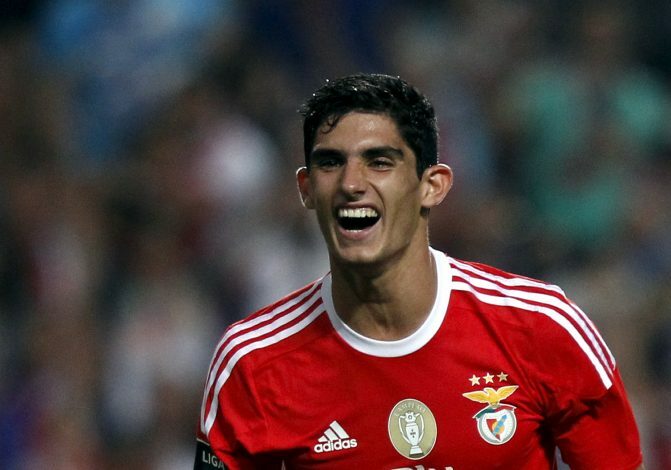 Many fans have compared Guedes to a young Cristiano Ronaldo, and it is clear that the teenager is immensely talented, and Benfica will certainly be in no rush to cash in on Guedes. But, there is no guarantee of the player’s quality in the English leagues, meaning that paying up a massive £52 million for the player will be a huge gamble for the club.